After a long morning and afternoon packing and moving to a new place (in Singapore). In the evening there was another “session” to rush for. Shouldn’t have bought the show on the same day as my house moving. But never knew it fallen on the same day as I have bought the tickets 1.5 months before. It was my first time going for a theater in Singapore, entering into the Esplanade Theater (the durian shape building).. hmm..actually it was not my first time going for theater though. My first time was in Las Vegas, United States.. whereby there were many shows going on there. I went with my brother and myself. It was a long time.. i think 12 years ago? How i wish i still can go travelling around the world like i used to. Ok.. I bought Sing Dollar because seems like a comedy show… I am kind of a comedian person myself too. Like jokes and laughters. And I don’t like shows full of theater singing.. as this will drive me to ZzZzZz….The esplanade theater is pretty cool though.. I bought the lowest price seating (me no rich person lah). S$38 per ticket. People taking these seats have to look down to the stage. Yea.. vertically 60 degree down. The interior of the theater is similar of what we seen in most of the movies. 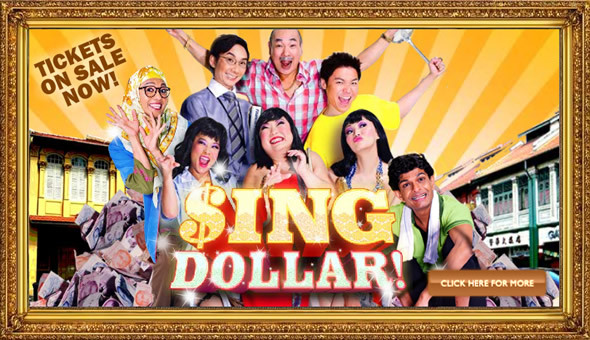 As for Sing Dollar, hah…. the story is basic though, but can tell the actors and actresses put a lot of hard work on making the show successful. One thing that impressed me was the changing of clothes.. they can change the clothings forward and backward and forward and back to the same clothes.. many times and in a short time. Funny people funny story and is all about money. The show last about 2.5 hours… 20 minutes break time in the middle. It is fine to watch this show once in a while…. The comedians – Sebastian Tan, Hossan Leong, Lim Kay Siu, Selena Tan, Pam Oei, Emma Yong, Kumar and Najip Ali…Who do I like?… 1st I like Kumar, 2nd…. I like Najip Ali. I think i like the way they do the acting and talking with the accent of Indian and Malay. So far i wont rate this show full stars… probably 3 out of 5? The areas of improvement is the storyline – too basic… the Story was about a bag of money drop from the “sky”… and these people thinking of ways to betraying each other (the money suppose to be shared).. and one wanted to report police and others asked him to keep quiet. In the end, nobody gets the money, the bag of money burned due to accident when Najip Ali accidentally lost her balance, tripped, the bag of money fell in some soft of fireplace..